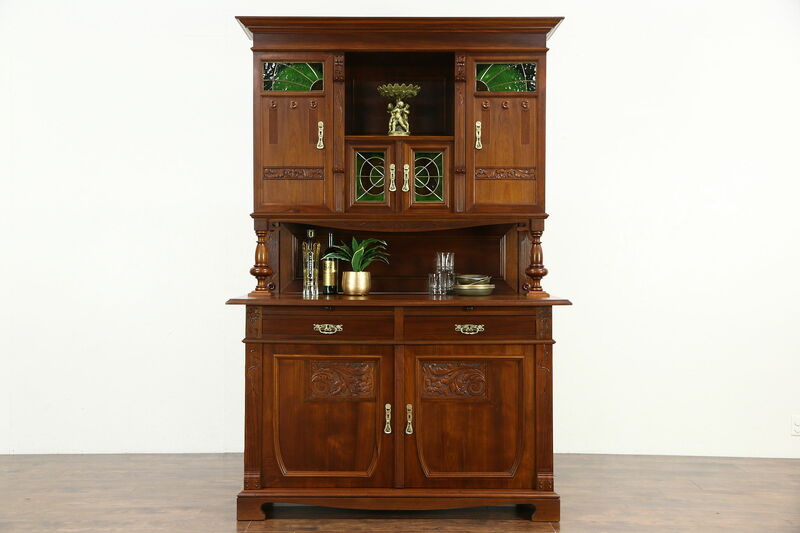 A lovely sideboard, server and china cabinet or back bar was hand carved about 1900 during the Art Nouveau period in Austria. The finish is in excellent condition on walnut wood. There are tiny shrinkage separations from age in the door panels and on one side, see photos. Stained glass panes and engraved brass hardware are original on this antique European furniture, locks have no keys. There are two pull out serving shelves. Drawers have solid oak sides with hand cut dovetail joints. Upper and middle sections are separate pieces for easier transport. Dimensions are 59" wide at the crown, 28" deep and 88 1/2" tall.